Castle on the Hill is a brand new luxury elevated 3 bedroom, 2 bathroom beautifully presented home that is ideal for multiple families holidaying together or a large group. The stunning mountain views, open plan living and wood fire heater will appeal to all who choose to stay. 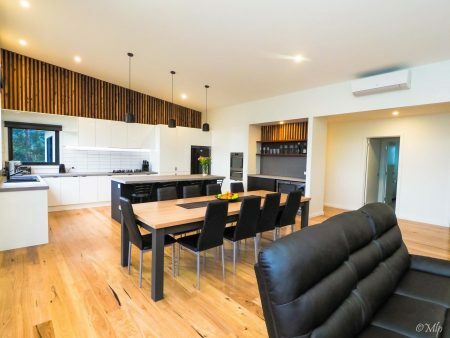 This is an ideal place to relax, enjoy the company of friends/family while enjoying the comfort of home and is just a400m walk into the centre of Marysville. There is a King Master Bedroom with ensuite, second bedroom is a Queen Bed and third bedroom has 3 sets of bunks. The main bathroom has inset bath and a separate Powder room. The main open plan living area is a huge space to entertain and enjoy family meals and experiences together. It features a large 55 inch flat screen TV, day bed, comfortable lounge suite. The comfort of this room is taken care of by a large split system and wood fire heater that creates a warm, homely atmosphere on those cold wintery nights. There is also a handcrafted Victorian ash dining table which comfortably sets 10. The kitchen is modern with a large single fridge, double oven, gas cook top, dishwasher, microwave, kettle, toaster and Breville coffee machine (ground coffee NOT suppplied).A bi-fold servery window opening out to the BBQ and main deack area. Adjacent to the kitchen is a full serviceable bar with double door bar fridge. Outside is the deck area that frames the majestic mountain views. There is an outdoor decking table that seats 10 as well as a Bar table that seats 5. A 4 Burner gas BBQ and two large sun umberllas. Step down off the main deck area and you will be able to enjoy the beautiful tiered lawn areas and relax amoungst the cushions and pillows on the day bed or light the fire pit to keep you warm. Fully equipped laundry with front loader wahsing machine and dryer. This house is Accessibility friendly with level entry off the driveway and alarge shower. A double car carport and extra 2 car spaces in the driveway. Sleeps 12, Child Friendly, Linen Included, Accessibility Friendly 2 Car Carport.